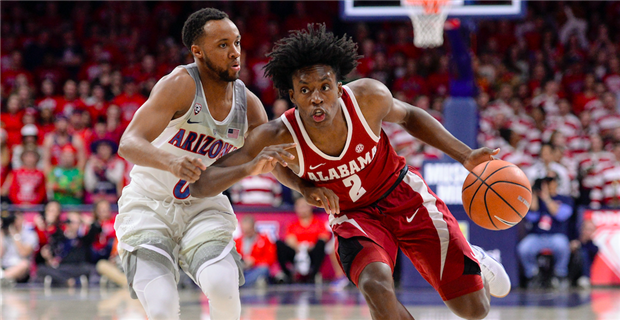 After a long 10-day layoff for finals, the Alabama men's basketball team will return to the court Tuesday night, this time in Huntsville, Alabama for the 2nd annual Rocket City Classic. Alabama's opponent will be the Mercer Bears from the Southern Conference. The Rocket City Classic has expanded to a doubleheader this season; the hometown Alabama-Huntsville Chargers will play in the first game. Alabama will play at 8 P.M. CT. The game will be televised on the SEC Network. The game is expected to be at the very least a near-sellout as the event had less than 100 available tickets going into the weekend. Click the links for team and Pomeroy stats. My Two Cents: If this past weekend in college basketball has taught us anything, it's that the week heading into Christmas can produce some weird results. Six top 25 teams have lost to unranked opponents so far (may be more by the time this is posted). Alabama isn't ranked of course, but a loss to Mercer would still count as a big upset. That said, it's fair to wonder where this Alabama team is at mentally, coming off a 10-day break that included taking finals. It would only be natural if our guys are flat when this game tips off. Mercer will be playing their second game in 48 hours after a Sunday night game at La Salle (a 95-85 loss). I think teams with a quick turnaround actually have a physical and mental advantage over their opponents, particularly if that opponent is coming off a 10-day break. Players to Watch: Unless there's a setback, this game should be the debut of Braxton Key for the 17-18 season. While having a healthy Braxton would have likely resulted in a better win/loss record for the team up to this point, his absence has allowed other players (Herb Jones, Galin Smith and Alex Reese) to play more minutes and gain much-needed experience than they may have if Braxton had been healthy to start the season. Not sure if he will start right away, but Braxton's return certainly gives this team more experience, leadership and skill on the floor. As he gets back to full strength, assuming everyone can remain healthy, I think we'll see this team begin to progress towards its ceiling for this season. Another Bama guy to watch on Tuesday will be John Petty, returning to his hometown for this game. No doubt he'll have a vocal cheering section, and it will be interesting to see how John handles the pressure to perform well. I thought he overcame a shaky start in Tuscon to play his best game since the BYU game in Brooklyn. Ria'n Holland (20.7 ppg, 57.3 FG%, 60% from 3, 91.4% FT, 3.2 rpg, 2.4 apg, 1.5 spg) missed three games for Mercer due to an injury, but did return for their game vs Florida A&M and scored 24 points, knocking down 75% of his 3-point attempts. On Sunday night, he scorched La Salle with 33 points (6-9 from 3), 4 boards, 2 assists, and 2 steals. Needless to say, he's a problem.